Occasionally, a tree can grow to the point where it can no longer support its own weight. This problem typically occurs in big trees with multiple trunks, large canopies or trees whose branches attach with a “V” shape. The situation can worsen during periods of snow or rain, when wet leaves increase the weight of the foliage. Strong winds can also exacerbate the problem. Multi-trunk trees are more at risk than single trunk trees because the limbs extend away from the center of the trunk. The foliage on the limbs will increase the weight on each side of the trunk. When a big tree’s branches are attached in a “V” shape, it increases the likelihood of vertical splitting. The main reason for splitting is insufficient connective tissue between the stem and the tree trunk, and the bark between the stems. The larger the angle of the “V”, the more chances a split will occur. Structural issues can also appear when a tree has long and heavy limbs, especially if the limbs grow horizontally or downward. Poorly anchored trees can lead to support problems as well. Inadequate anchoring usually happens when the tree has been planted in shallow or compacted soils, has root damage or an improper rootball. A branch or trunk with insufficient support can fail, causing a decline in the health of the tree, property damage or even personal injury. Many times, cables and braces can be used to provide the structural support the tree needs. They can extend the life of a damaged tree and minimize potential hazards due to branch failure. Cables, which have better leverage than rods, are generally placed high in a tree. They minimize branch movement and breakage. The cable will usually be installed 2/3 of distance from the weak area to the branch ends. Bracing involves the use of rods, which are installed either above or below the branch that needs support. Braces help prevent the leaders from moving sideways or spreading apart. They are usually installed with cables. Once the cable or brace has been installed, it should be inspected on a regular basis for damage from wind, rain and other elements. Another way to provide big tree support is with guying. This method involves the use of a cable that is attached to the tree on one end and an external anchor on the other. Guying is often a support solution for trees with root issues. Pruning can help reduce tree weight and potential support problems as well. A big tree specialist is the best person to consult when identifying trees that need support, deciding where to place cabling and braces, and the type and size of support to use. 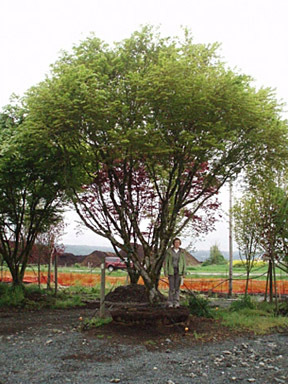 A tree supplier specializing in big trees can also tell you if your tree can be saved with additional support, or if your money will be better spent purchasing a new tree.